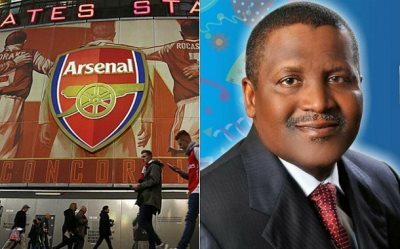 AFRICANGLOBE – Aliko Dangote, Africa’s richest man, has disclosed his reason for seeking to acquire a stake in English Premier League team, Arsenal. Few weeks ago, Dangote, 58, attracted widespread criticism from various quarters in Nigeria when he re-iterated his interest in acquiring the Premier League team. Many Nigerians called him out, insisting that his money would be better spent by acquiring a local Nigerian football team and promoting the Nigerian Premier League rather than spending on a foreign club. But speaking to senior Nigerian journalists in Lagos on Saturday, the Nigerian billionaire explained that he is interested in buying the Premier League team to promote Nigeria internationally. “The issue is that if I buy all the Nigerian clubs, the Nigerian flags will continue to remain here. But buying Arsenal will take the Nigerian flag worldwide. Just like whenever Abramovich is mentioned, the name of his country, Russia comes up. Everyone knows he’s Russian,” Dangote said. In 2010, Dangote made an attempt to buy a small stake in the club but was rebuffed. He is still hopeful of owning the club someday and was recently quoted as saying that he intended to buy the team at the right price. At the moment, Arsenal’s largest shareholders are American billionaire Stan Kroenke and Russian steel magnate Alisher Usmanov who own 66.6% and 30% of the Barclays Premier League club respectively. None of them has expressed any interest in selling to Dangote or to anyone. Dangote is Africa’s wealthiest man with a fortune currently estimated at $17.5 billion derived from investments in cement manufacturing, sugar and flour. Next articleWill Putin Pay For $100 Billion South Africa Nuclear Plan?